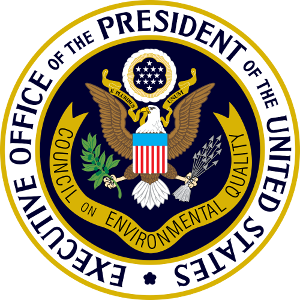 In August of last year, President Trump issued Executive Order 13807 directing the Council on Environmental Quality (CEQ), a division of the Executive Office of the President, to review rules related to the implementation of the National Environmental Policy Act of 1969, which are 40 CFR parts 1500-1508. The goal of this directive was to “enhance and modernize the Federal environmental review and authorization process.” Much of the language in the Executive Order is focused on speeding up the environmental review process, making sure that one lead Federal agency takes charge, and that as much work as possible is coordinated between agencies. While one could debate whether or not the protection of the environment has anything to do with this directive, it does open up some interesting possibilities to actually make NEPA perform better. The CEQ responded to the Executive Order by posting a list of twenty questions asking the public (yeah–that’s you!) to provide feedback on the NEPA rules. These questions are surprisingly open ended and invite the public to comment on just about any part of the NEPA process. And, yes, anyone can post a comment that, at least theoretically, might influence CEQ’s rule change directive. As of July 13, 2018, only 439 comments (!) had been posted, even though the commenting period opened on June 20, 2018. Either no one cares about what might be a massive change to the NEPA rules or no one knows that CEQ is asking for public comment. Or perhaps both? The CEQ is clearly concerned because they’ve now extended the commenting period from one month to two–the new deadline is August 20, 2018. Regardless, one of the reasons I’m posting this note is because I think it’s an absolute embarrassment that out of 250 million or so adults in the United States and the many thousands of people who work in the environmental review industry (e.g., cultural resource management), only 439 people bothered to share any concerns with the CEQ. Wow. But, those of you in the United States who work in historic preservation or care about its activities might ask why any changes to NEPA really matter. Beyond the obvious conclusion that the NEPA rules are largely what is responsible for protecting our natural environment for future generations, NEPA requires that any federal undertakings be looked at for their effect on the “human environment”, which is the environment as a whole–natural and cultural. So, NEPA regulations absolutely impact historic resources in a fundamental way. Perhaps most importantly, the NEPA process is usually coordinated with Section 106 of the National Historic Preservation Act, and this kind of coordination is certainly being considered for change under CEQ’s NEPA rule change proposal. And in a battle over NEPA versus 106 process, who do you think will win? From my perspective, I see a lot of potential in this rule revision process to help NEPA focus more efficiently and accurately on adverse impacts to the human environment as well as changes that affect the quality of the human environment. 40 CFR Part 1508.14 defines the “human environment” as a “comprehensive” interpretation of “the natural and physical environment and the relationship of people with that environment.” This definition has existed since the early 1970s, and as it was originally conceived, social scientists were supposed to be involved in the preparation of what is commonly called “social impact assessments.” The NEPA rules don’t actually require the preparation of social impact assessments, but their use is implied when Part 1502.6 directs that “Environmental impact statements shall be prepared using an interdisciplinary approach which will insure the integrated use of the natural and social sciences and the environmental design arts.” So, from the beginning, social science approaches were supposed to be an integral part of creating an environmental impact statement and social scientists were supposed to be involved in creating these reports. But, with few exceptions, they aren’t, and never have been. Social scientists are not involved in creating the vast majority of NEPA reviews even though this perspective is actually required in the existing NEPA rule. Most people who create environmental impact statements are trained in the biological sciences, engineering, and/or architectural history and not in any of the social sciences (e.g., anthropology, sociology, psychology). Social impact assessments are often prepared by people who are not trained social scientists—there are no anthropologists, sociologists, or environmental psychologists doing this work. Functionally, social impact assessments read more like socioeconomic or market research studies focusing on an analysis of cost/benefits. There is no attempt to actually gather data directly from the people who will be affected by a federal undertaking. Existing socioeconomic data sets (e.g., census data) are usually the only data accessed. Ethnographic or environmental psychology perspectives are rarely considered, much less included, in social impact assessments. Common social science methods such as qualitative interviews, participant observation, and survey instruments are not used to collect data. So, naturally, if asked how a revised NEPA rule could/should work, I would suggest the involvement of social scientists and some kind of requirement to actually collect data directly from the affected population that, as the definition for human environment indicates, would help understand the “relationship of people with that environment.” This would address a lot of the questions that CEQ is asking about ways to for “public involvement be revised to be more inclusive and efficient.” But, if we really are addressing people’s relationship with the environment, surely there should be some kind of focus on environmental psychology as well as ethnographic approaches. All of this is what I have been writing about and researching over the past 10 years, and is well represented on this blog. Another way to address better involvement of the public would be to borrow a bit of the process already used in Section 106 and change NEPA to require consultation with people who are affected. Technology could be used to vastly speed up this process by improving both the speed and bi-directional dissemination of information between NEPA consultants and the public. Some of these tools could involve blogs, citizen forums, online chat rooms, e-feedback mechanisms and apps, VR models, participatory GIS, games, augmented reality, and social media (including big data tools to analyze data collected through social media). A portal that would allow citizens to see where environmental review projects are taking place would solve a significant problem in that most people don’t know about environmental issues that are taking place, even in their own communities. Existing systems for engaging and notifying people about the NEPA process is woefully antiquated and inefficient. Whether or not you agree or disagree with my perspective is not nearly as important as making sure your voice is heard by the CEQ. Visit the proposed rule change site for NEPA and add your own comments. Freudenburg, W.R. (1989). Social scientists’ contributions to environmental management. Journal of Social Issues, 45(1): 133-152. Glasson, J., Bellanger, C. (2003). Divergent practice in a converging system? The case of EIA in France and the UK. Environmental Impact Assessment Review, 23: 605-624. King, T. (2010). Estudo de impacto ambiental, gestäo de patrimônio cultural e bens históricos. Aprendendo com os erros dos Estados Unidos da América. Cadernos de Ciências Humanas 11 e 12, Números 20 e 21, 2008-2009. Ilhéus-Bahia, Brasil: Universidade Estadual de Santa Cruz. Reser, J.P., Bentrupperbäumer, J.M. (2001). Reframing the nature and scope of social impact assessment: A modest proposal relating to psychological and social (psychosocial) impacts. In A. Dale, N. Taylor, M. Lane (Eds. ), Social assessment in natural resource management institutions (pp. 106-122_. Collingwood, Australia: CSIRO Publications. Stoffle, R., Minnis, J. (2013). Resilience at risk: Epistemological and social construction barriers to risk communication (pp. 55-68). In A. Boholm (ed. ), New perspectives on risk communication: Uncertainty in a complex society. Hoboken: Taylor and Francis. Taylor, N., Dale, A., Lane, M. (2001). Conclusions: The way forward. In A. Dale, N. Taylor, M. Lane (eds. ), Social assessment in natural resource management institutions (pp. 283-298). Collingwood: CSIRO Publishing. Vanclay, F. (2006). Principles for social impact assessment: A critical comparison between the international and US documents. Environmental Impact Assessment Review, 26: 3-14. Couldn’t agree more. Although I think the CEQ request for comments is a sham, offering comments beats ignoring the opportunity, and the kinds of changes you suggest are on the money.